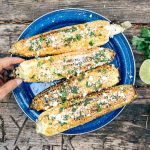 A quick and easy camping appetizer, Elote – grilled Mexican street corn – is a great way to make the most out of your campfire. It’s pretty obvious what you should do with a campfire after dinner (make s’mores or banana boats! 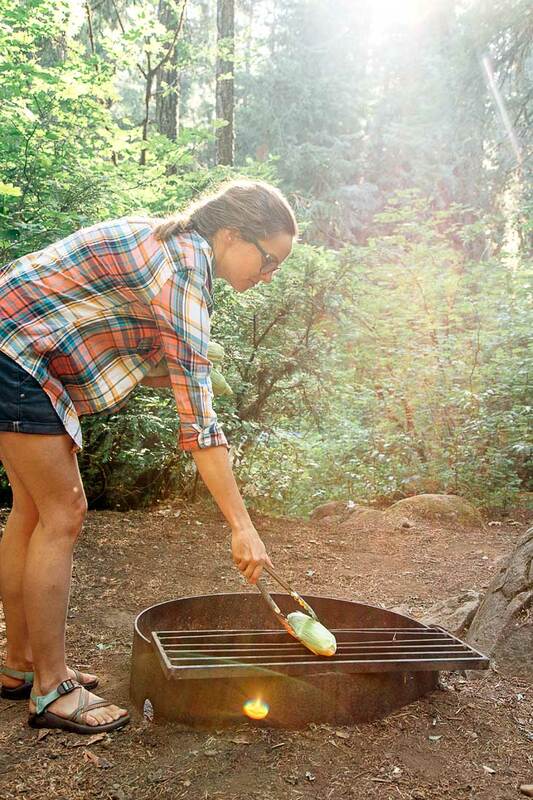 ), however, it’s not quite as clear what – if anything – can be done with the campfire before you start cooking dinner. Stare at it? Poke it with a stick? Comment on the quality of the wood? All excellent suggestions. We do love ourselves a good fire poking session. But after we’ve gotten that out of our system, another good idea is to make campfire appetizers. There a lot of great pre-dinner snacks that can be made over the flames of a new fire. 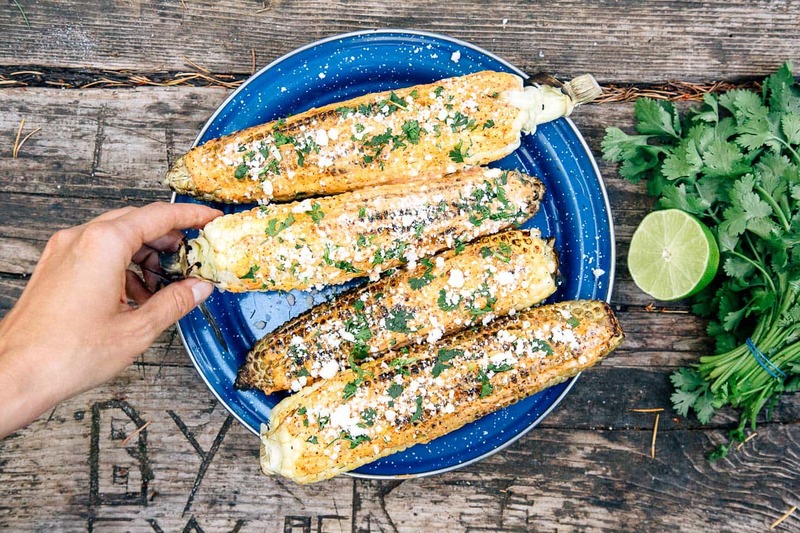 And one of our favorites is Mexican street corn, or traditionally known as Elote. “Grilled corn? That sounds like a side to me,” you might be saying to yourself. That’s true, if you just plan on spreading butter on it, this would be a pretty boring appetizer. But elote is so much more. Elote is all about the toppings. Which is why it’s such a great pre-dinner campfire activity. 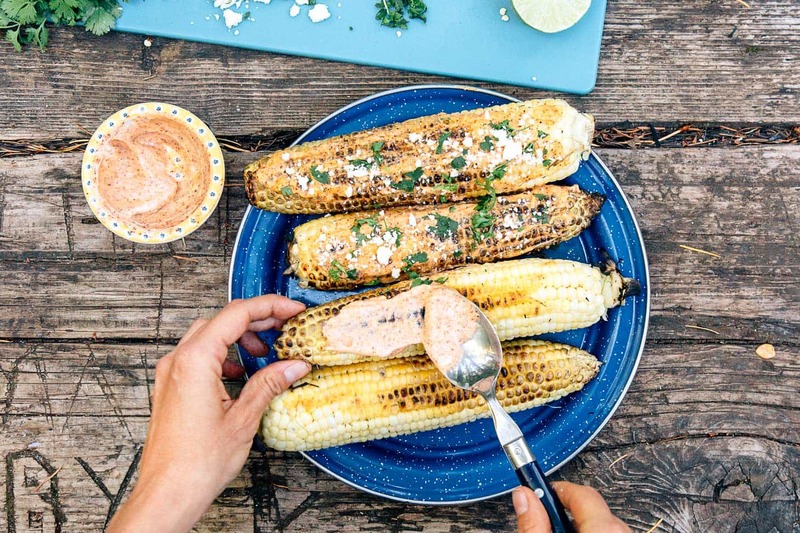 Traditionally served as street food in Mexico, typical elote toppings include: mayonnaise, crema, crumbled Cojita cheese, salt, chili powder, lime juice. But really you can add anything you like. For the elote featured here, we mixed chili powder, salt, and mayo into a spicy spread. 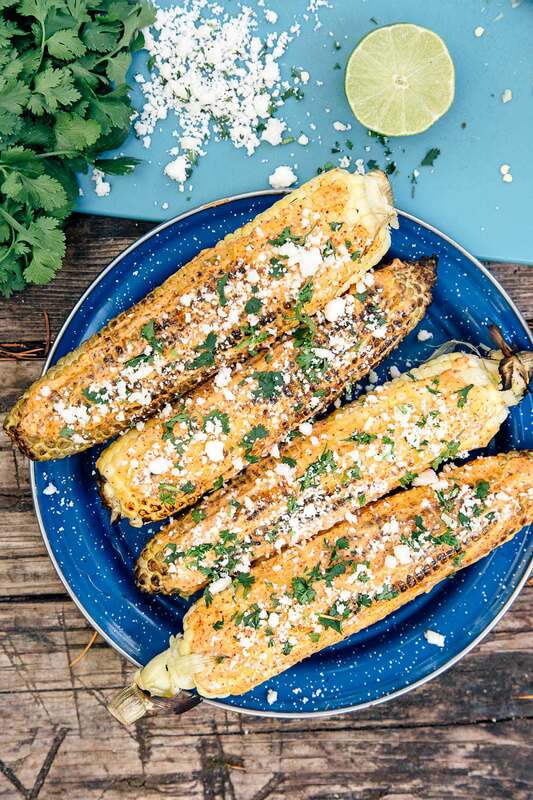 We then topped our corn with crumbled Cojita cheese and chopped cilantro. It’s a simple appetizer to make and a great pre-dinner activity. Maybe you want a late afternoon snack? Maybe you want to give your kids something to do so they stop throwing rocks at the fire? Either way, elote is a great option. Prep the corn by peeling the husks back (without detaching them from the bottom) and remove all of the silk. Replace the husks. 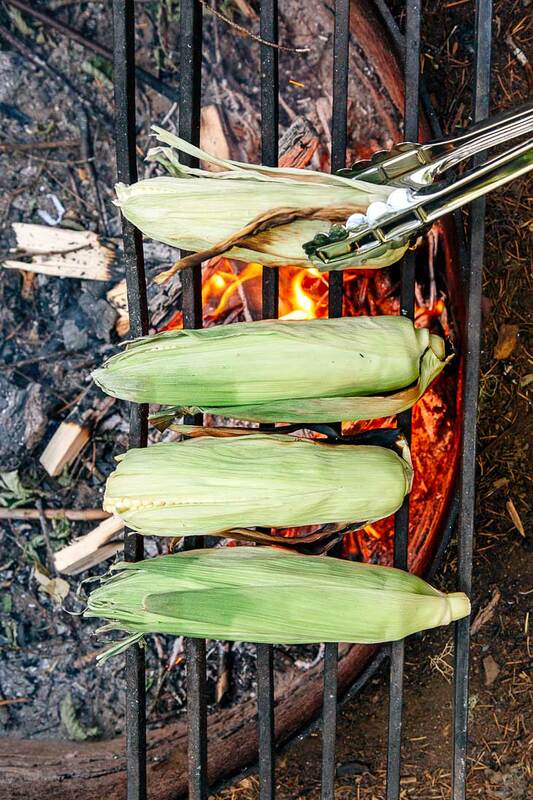 Place the corn on a grate over your campfire. Grill, turning frequently until the corn is charred in places and cooked through, 10-15 minutes. Remove from the grill and allow to cool a bit so they are safe to handle. Remove and discard the husks. Combine the mayo, lime juice, chili powder, and salt in a small bowl. Slather evenly all over the corn. Sprinkle the Cojita and cilantro over the top.